For The First Time, Women Will Graduate From Army's Rigorous Ranger School : The Two-Way This was the first class to allow women in more than six decades of Ranger training. NPR's Tom Bowman notes that 19 women started the course and two are graduating. A woman participates in the final phase of U.S. Army Ranger training, taking place in the hot humid swamps of the Eglin Air Force Base, Fla., earlier this year. 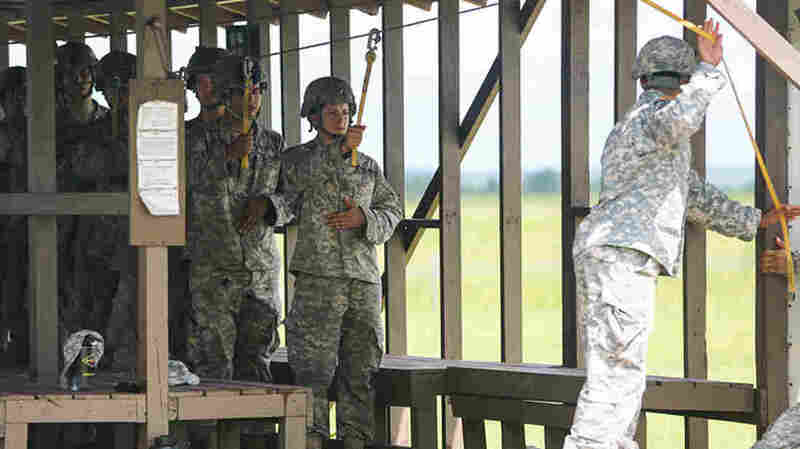 For the first time, two women completed the training, the military announced Monday. Two women have completed the Army's tough Ranger School, officials say. Both are in their 20s and are lieutenants. 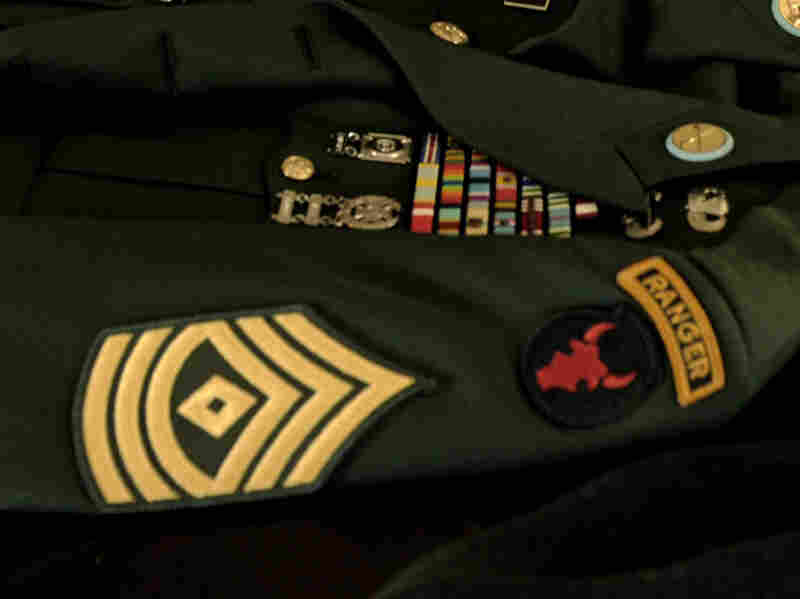 The Ranger tab is displayed on a U.S. Army military jacket. The Army announced on Monday that, for the first time, two women had graduated from the prestigious Ranger school. NPR's Tom Bowman reports that the women, whose names haven't been released, attended West Point and will graduate with the rest of their Ranger class on Friday. The Pentagon has not decided whether they will be approved for ground combat. "They'll now wear the Ranger tab on their uniforms," Tom says. "A coveted award among infantry soldiers." "Each Ranger School graduate has shown the physical and mental toughness to successfully lead organizations at any level. 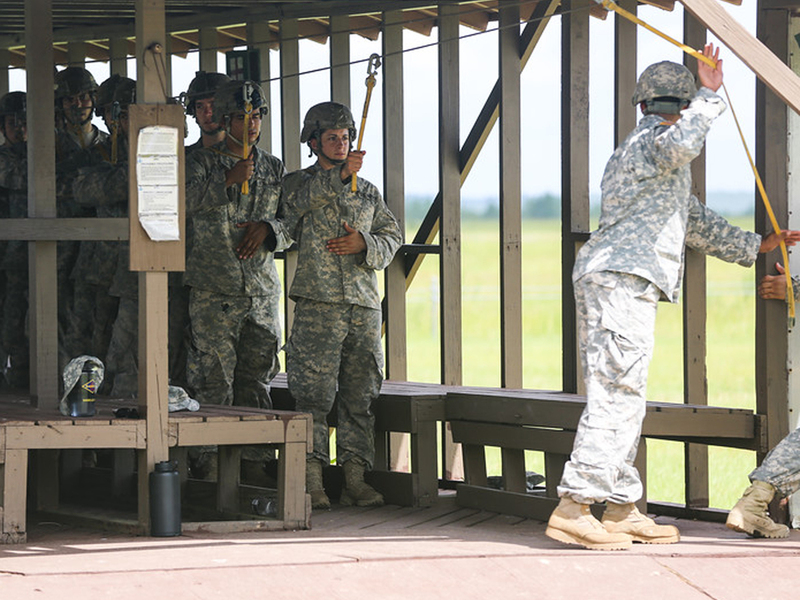 This course has proven that every Soldier, regardless of gender, can achieve his or her full potential. We owe Soldiers the opportunity to serve successfully in any position where they are qualified and capable, and we continue to look for ways to select, train, and retain the best Soldiers to meet our Nation's needs." The Ranger course began in 1950. The Army says that around 40 percent of male soldiers in Ranger School graduate. "Gen. Ray Odierno, the Army chief of staff, has previously said Army leaders will monitor the pilot program. "He added: 'We don't know if it's five people graduate, or 100 people graduate, or no one graduates. This is just a pilot to gain information for us to understand where we are, and then we'll take that data and make a determination on how we want to move forward.' "
Tom describes the two-month Ranger training as grueling. It begins in Fort Benning, Ga., where soldiers train in the mountains, and ends in the swamps of Florida. The program admitted women as "part of an effort by Pentagon leaders to determine whether women can be assigned to ground combat units in both the Army and the Marine Corps."